Based on the tremendous success Taste of Home Books experienced with best-selling titles “Slow Cooker,” “Slow Cooker Throughout the Year,” Casseroles, Slow Cooker & Soups,” “Comfort Food Diet” and “Comfort Food Makeovers,” it seemed like a natural fit to offer today’s family cooks a collection of slow-cooked dishes that make healthy eating a priority. Inside this collection, readers will find common ingredients, Nutrition Facts with every recipe, Diabetic Exchanges where applicable and, most important, mouthwatering meals that come together in a slow cooker and satisfy the entire family! A special icon notes dishes that call for five ingredients or fewer and prep and cook timelines make meal planning simple. Two “Bonus Chapters” help family cooks round out menus with garden-fresh salads and light desserts that skim back on calories, sugar and fat. Best of all, these recipes come from real home cooks who know how to serve healthy family meals and save time in the kitchen. These are the dishes they rely on most…and the foods that received thumbs-up approval at the dinner table. 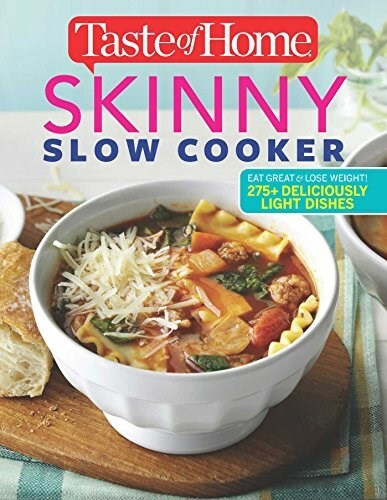 Cooking smart, eating smart, losing weight and feeling great has never been more delicious than with Taste of Home Skinny Slow Cooker!